What a wondrous evening it was! 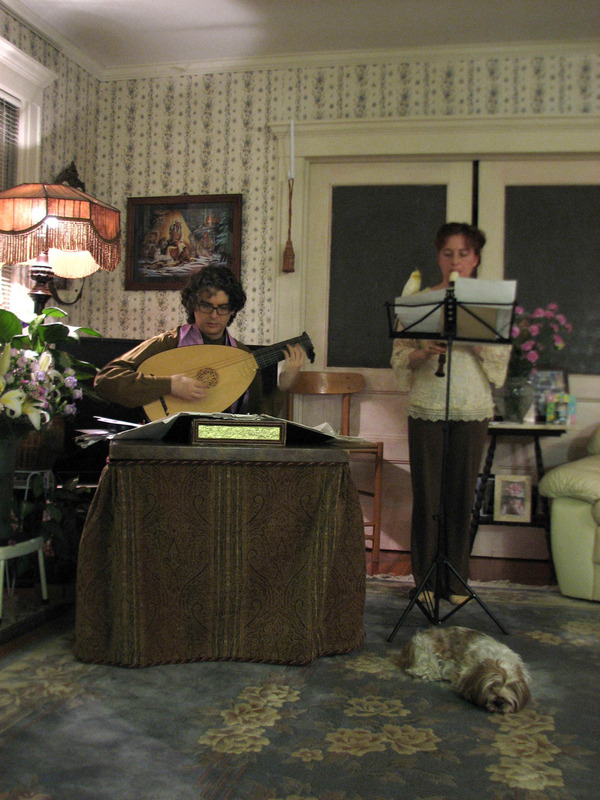 Kokila Bennett, a composer of original Celtic style music, has over 30 years of musical playing experience. Her favored instruments include the piano, recorder and folk harp. 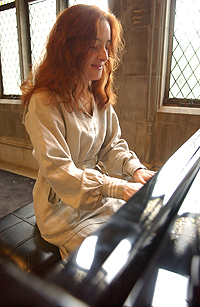 Growing up on the Sands Point Preserve, she drew her musical inspirations from the lush green scenergy and English styled medieval architecture. Kokila ran the "music in the Mansion" concert series for Nassau County Museums, performed at Hempstead House, Sands Point for over two seasons. Kokila is currently sharing her musical prowess and teaches piano full time to children. She also composes and records her own music CDs. Over the years, the Village of Roslyn has produced more than its share of creative artists. Some, such as William Cullen Bryant and Christopher Morley, adopted Roslyn as their hometown. Others such as the prolific novelist Michael Crichton grew up in the village and as often is the case with ambitious small town youth, sought their fame elsewhere. Ms. Bennett’s mother was also a folk singer and this led her to the world of music. Growing up in Roslyn, the music of Chopin, Shubert and other romantic composers were a big inspiration to Kokila, who was trained in classical music. Also important was the influence of British culture in the Bennett household and on the old Long Island of estates and castles. In 1993, after her mother died, Kokila started composing, partly as a way to ease the grief from her mother’s passing, but also, she said, as part of a spiritual quest. In time, Kokila had found that her music had greatly comforted her ailing mother and people started buying her recordings to play for people who were ill, even seriously so. In addition, Kokila began performing her music on solo piano around libraries and museums in the New York area. Soon, Ms. Bennett found a producer who helped her with her first CD, Celtic Angels, released in 1994. After that she worked alone and has released numerous recordings through her own label, Avalon Isle Music. Among her other recordings are: Enchanted Dreams (1998), Magic and Mystery (2002), Trilogy, a three-disc set released in 2004, and a 2007 re-release of Enchanted Dreams. In addition to her live performances and recordings, Kokila also enjoys giving piano lessons to young people living throughout Long Island. Recently Kokila has started singing along with her solo piano performances and has released new recordings on YouTube and other places on the Web. Ms. Bennett’s next live performance will be Saturday, Oct. 10 at 7:30 p.m., when along with Master Lutanist Chris Moriangello, she will be giving a Lute and recorder concert in a private historic home in Lynbrook. Call 987-7623 for reservations and directions. Kokila can be reached for private lessons, or for performing at private events or public concerts through her website http://kokilamusic.com or by phone at 987-7623. Precious the bird and Petals the dog go everywhere with Kokila, and they enjoy the music, the atmosphere and people. Precious adds her song to the festivities...they are a sweet pair! 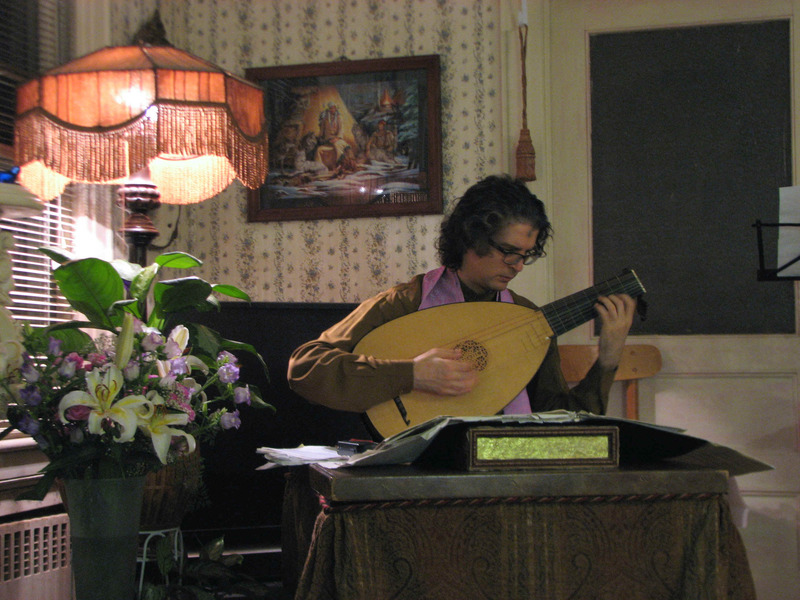 A member of the Lute Society of America, and Teacher at University, Christopher explained how the Art of Intabulation continues to unite lute players across the centuries. He also explained what Intabulation is, and as I understand so far; that is the notations in the written music that tells the musician where to place fingers...thereby allowing the sound its authentic origins. He uses copies of the original, often hand-written compositions. 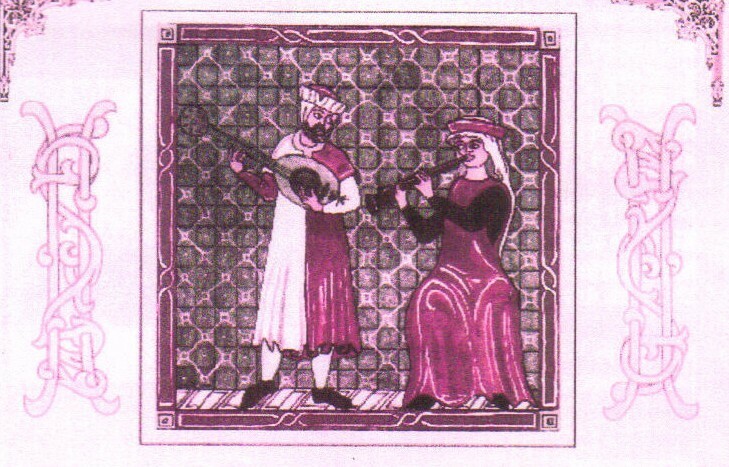 Chris painted a picture of the Lute's history, with origins in Greek antiquity, into the Baroque Age and beyond. There is grace and fullness in keeping the threads of origin connected to your today; whether you are a car enthusiast, musician, blues singer...*smile*...we are enriched by it. Our experience was further enhanced when Scarlet, Christopher's wife, brewed true Chinese green tea for us. Scarlet's father is a Tea Master in China and we were privileged to sample tea he cured and sent to her. She taught us that the tea must be fresh; each spring fresh tea is harvested, and leftover tea from the previous year discarded, as the antioxident qualities and taste diminish over time. I can vouch that the taste was wonderful; no acidic taste I've experienced in teas I've purchased...and my sinuses cleared about 10 minutes after I drank the tea. Today, the next day, I had the tea again...with the same result. Scarlet mentioned, as I remember my Mother and her Mother telling me, that the water should be brought only to the brink of boiling and then set upon the tea leaves to gently brew them. Off I go for my cup of Mao Feng. Scarlet has agreed to perform a Formal Tea Ceremony here at Windhorse School of Metanoia! Kokila and I plan many more Gatherings of Like-Mindedness and Kindred Spirits! sorry that's the best I can do at the moment to share a lovely video from uTube of Christopher and 3 other lute players. copy and paste it into the address field on your browser if it doesn't click for you. More pictures were added, thanks to Joe!